After all the leaks and teases, it’s now official: Call of Duty: Infinite Warfare is a thing – weird name and all – and its special edition comes bundled with a remastered version of the original Modern Warfare. For now, why not play through our list of PC’s best FPS games. With a Modern Warfare remaster being bundled with special editions of Infinity Ward’s latest, it kind of feels like the studio wants to make a statement. Could this be the Call of Duty sequel that matches the impact that game had at launch? It seems to be the biggest departure, at least. Instead of sticking to a contemporary setting or taking us to dronetastic future, this one sits you in the pilot seat of a space-fighter and takes you into orbit, battling in zero-gravity among the husks of dilapidated dreadnoughts as starships zip around you. 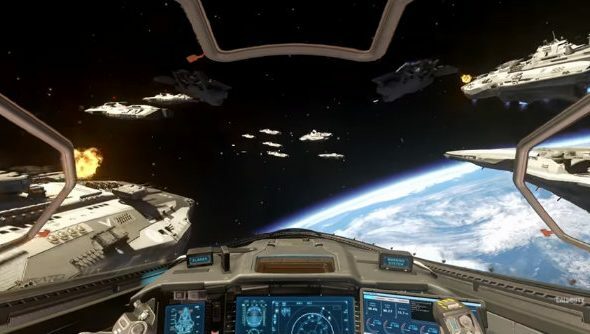 “With Call of Duty: Infinite Warfare, we are taking Call of Duty to places fans have never experienced in the series,” said Dave Stohl, studio head of Infinity Ward. “On one hand, this game is the kind of gritty, boots on the ground, visceral war story that Call of Duty is known for. On the other, its future setting takes players on a journey of epic scale and proportions, providing incredible gameplay innovations and new experiences for our fans. Call of Duty: Infinite Warfare launches on November 4.